The Dokan Vendor Registration Template will allow site admins the flexibility to add more fields to their Dokan Multivendor plugin registration form with the help of WPUF, which is otherwise limited. Vendors registering in Dokan Multivendor with this form will automatically get assigned as vendors under user roles. Admins can add extra fields as desired. Click on Add Form. Then select Dokan Vendor Registration Form. Click on Create Form to open. This is how your Dokan Vendor Form will look from the frontend. 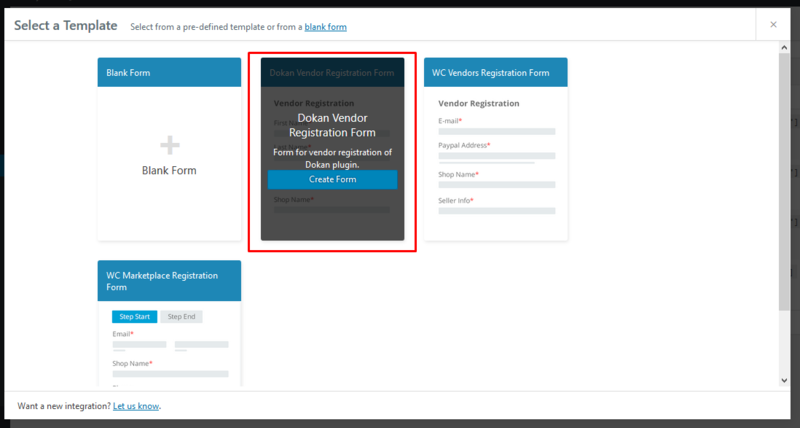 When vendors submit the form, they will be redirected to the Dokan vendor dashboard for configuration in the following ways.